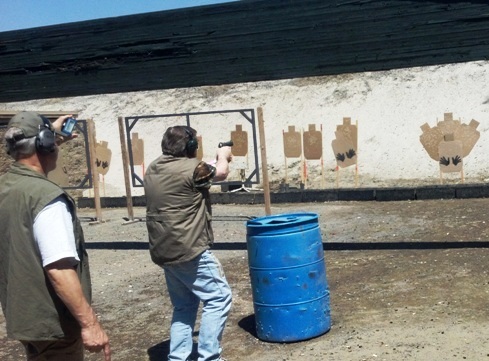 So, when you head to the range do you shoot or do you train? Shooting is just the act of burning powder; sending rounds to the target without any forethought. It’s fun. For some people it is therapeutic. But it is not training. Training involves that active thought which ensures you are performing your task correctly. In the early stages of training, you might want to talk yourself through the steps you are performing as a reminder that you are doing things correctly. Is your grip correct? Are you pulling with your support hand and pushing with you firing hand creating isometric tension? Hand high on the backstrap. Pistol centered in the web of your hand. Trigger finger indexed on the frame away from the trigger. Three lower fingers wrapped around the frame. Meaty part of the support hand pressed against the pistol. All four fingers of the support hand wrapped around the three finders of the strong hand. If you talk your way through each step during the first 100 times you practice something, you will learn it more quickly and it will become more deeply ingrained in your brain. As it becomes more ingrained into your brain, muscle memory will begin to take over and you won’t have to think through every step as much as it becomes natural and almost instinctive. This is why I think women make better shooting students than men. Women want to know every little thing. They want to know the why and how. Men, for the most part, just want to see the outcome. There is also an undercurrent with some men that they should just “know” how to shoot. Many men were taught to shoot at a young age by their fathers, grandfathers, or some other family member—and these rudimentary skills became the basis for their understanding of all things gun-related. But shooting is not intuitive. It is a learned skill that needs to be trained, practiced, and mastered. The more times you do everything correctly, the more likely you are to do it correctly under stress. I have said it before: You will not learn any new skills during a gunfight. You will not rise to the occasion. You will default to your lowest level of training.